Let's celebrate Christmas in July. 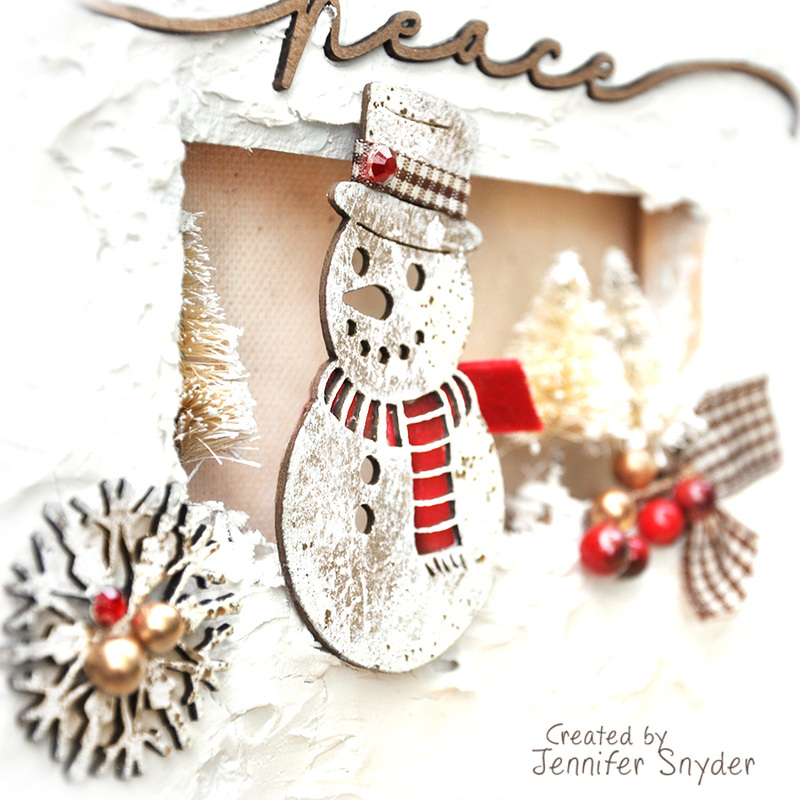 I'm sure many folks would agree that Christmas themed projects are fun to create year round. 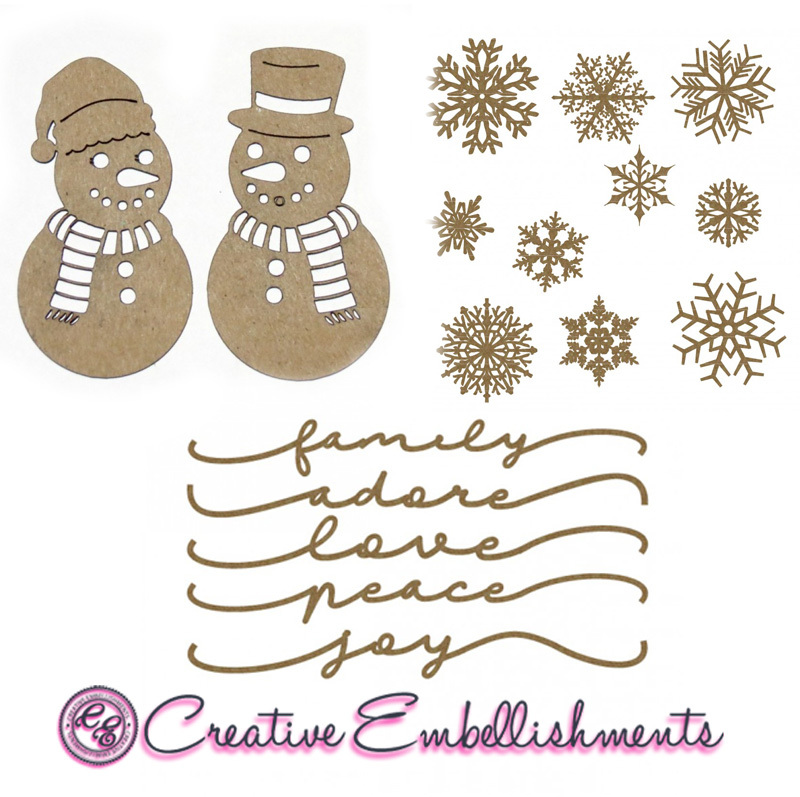 Creative Embellishments has a gigantic and amazing selection of Christmas and Holiday chipboard pieces to help gussy up any holiday project. Included in the collection is an adorable snowman from the Mr. and Mrs. Snowman set. And I totally adore snowmen especially when no real snow is involved. These started out as two separate 5x7 canvases and were hinged together in order to sit on a tabletop. 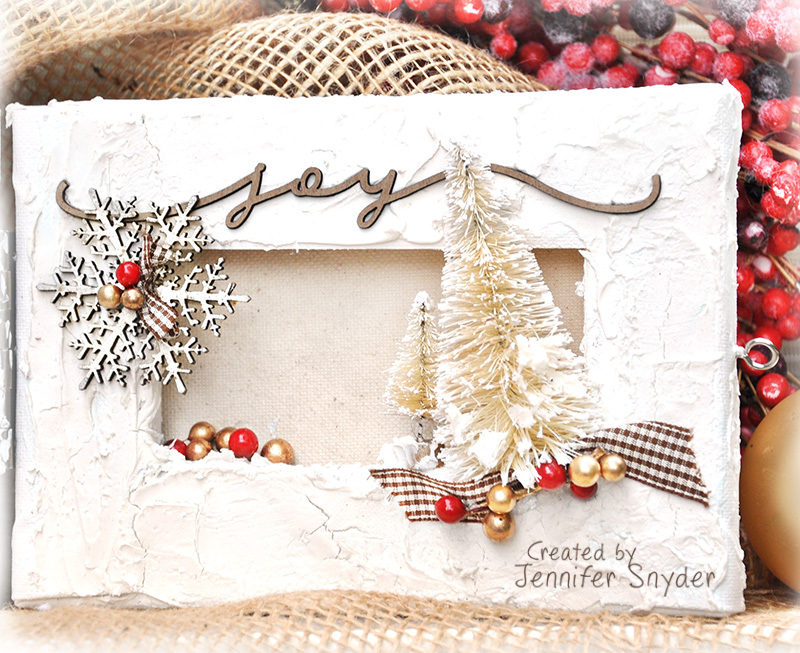 I smothered and slathered heavy molding paste all over the canvas to create a wintery frosty look. Creative Embellishments - Small Family Border Words set. Then I waited patiently for this to dry. Quite possibly the hardest part of any project. I'm going to talk a little about the sweet snowman. 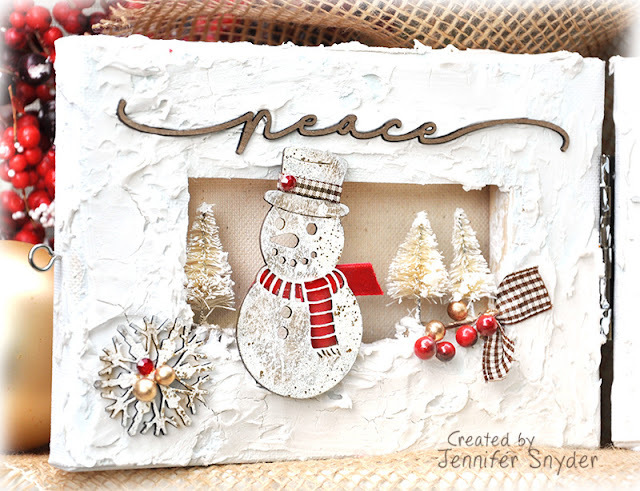 He's part of the Creative Embellishments Mr. and Mrs. Snowman chipboard set. Trust me - Mrs. Snowman is equally adorable. Save her for another project or for a holiday card. I used a sponge to lightly dab white acrylic paint onto the chipboard piece - making sure I didn't have the piece totally covered in paint. I like how the snowman looks with a bit of kraft color from the chipboard peaking through. 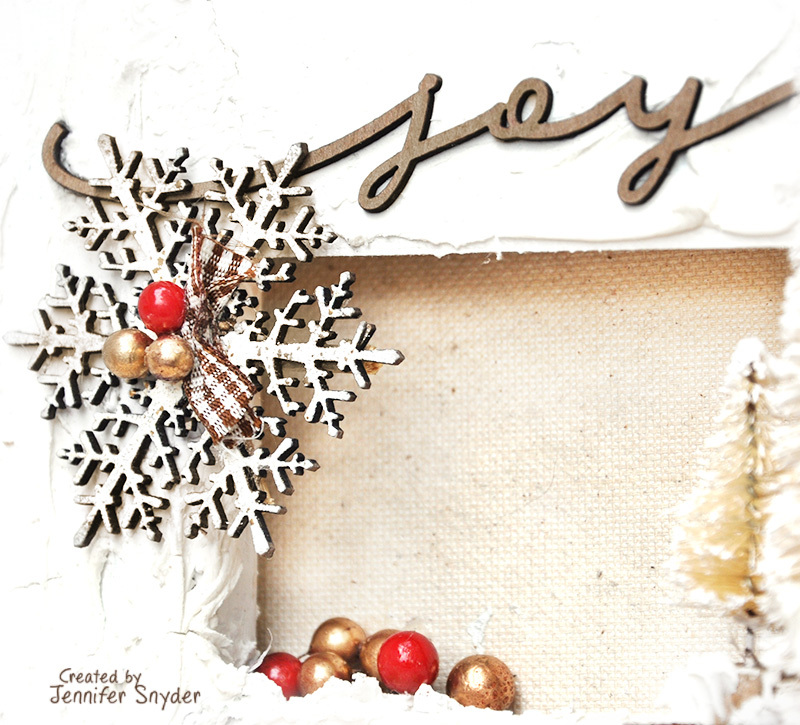 It also helps to blend the untreated chipboard words into the finished decor piece. I also added some red trim to the back of the chipboard piece to give the scarf a bold pop of color while maintaining the cool details of of the scarf. The snowflake was also lightly sponge dabbed with white acrylic paint. These are part of Creative Embellishments Large Snowflake Set. Thanks for stopping by and joining me for Summer in July. I'm headed to the seashore this week for a wonderful, warm sunny holiday. In anticipation, I pulled out the seaside collection by Maja Design called Life by the Sea. I find this collection to be soothing, peaceful and calming. It's possibly my favorite collection by Maja - timeless, classic and always comforting. I think the only time I'm not comforted by the collection is when it's almost gone. 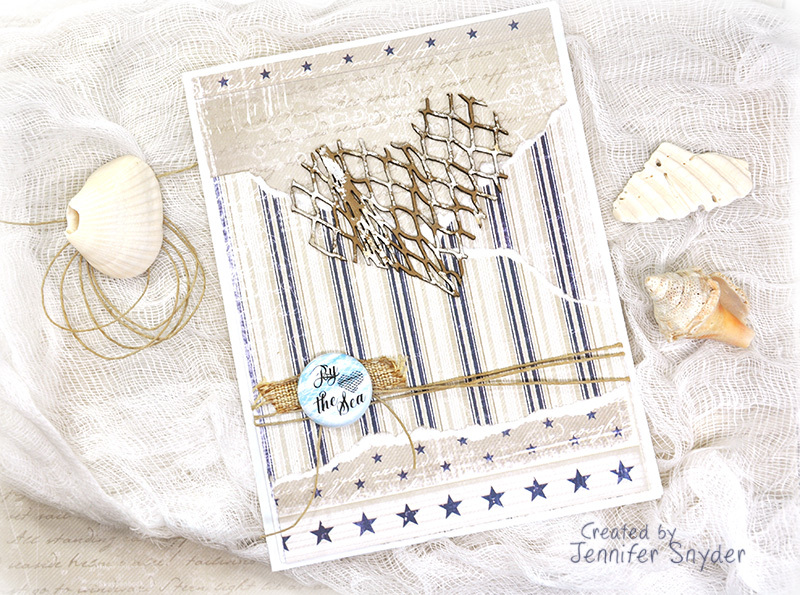 In order to give my card an extra pop of nautical fun, I added a chipboard heart net from Creative Embellishments and a flair button. I think the embellishments accent the papers perfectly. Here is one last image to show the dimension of the card. Thanks for stopping by today. Happy crafting. 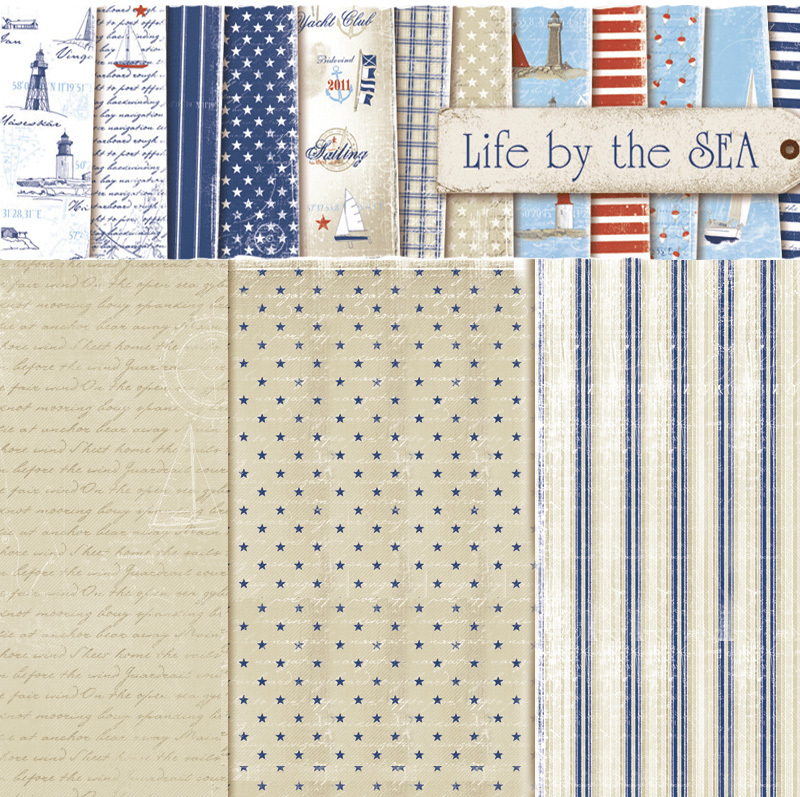 You can shop for "Life By the Sea" here. 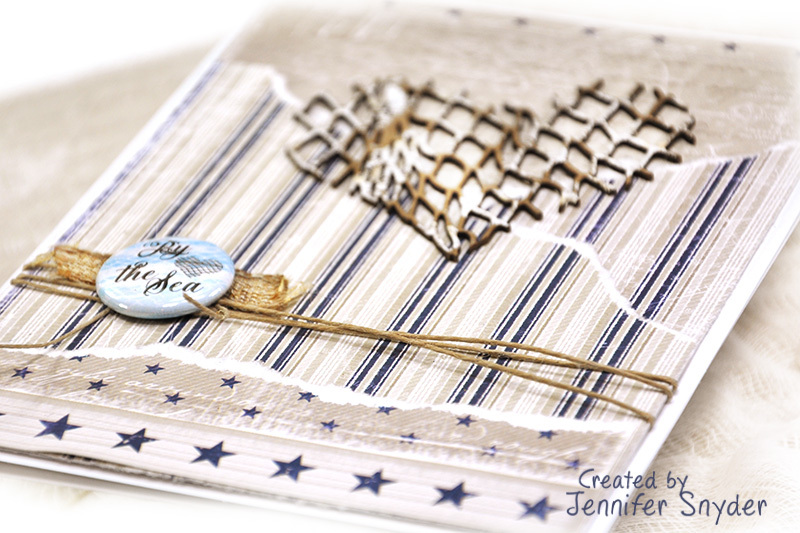 Today I'd like to share a quick DIY tutorial and two different perspectives using the same chippies. 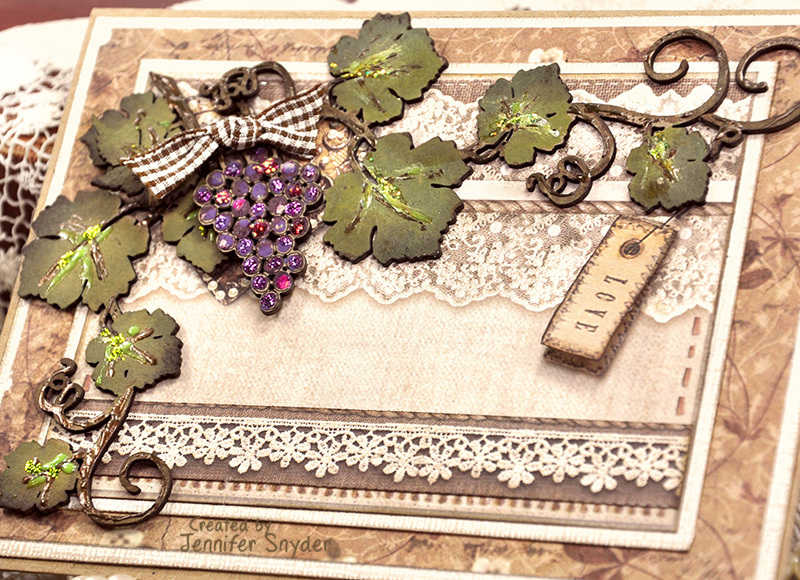 Scroll down to see my step-by-step DIY tutorial showing how I finished the grapes and grapevines. 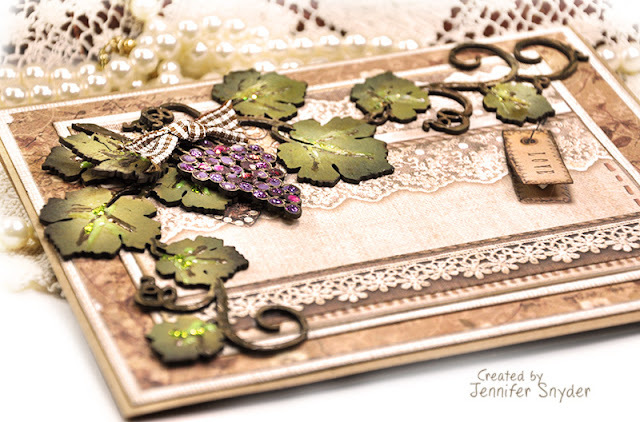 I've selected the gorgeous detailed Grapevines chipboard from Creative Embellishments to use as perfect examples of how the same chipboard can enhance different papers for totally different looks. I am also going to show my step-by-step (easy) process to making these grapevines look diVINE - and almost fresh picked straight from the vineyard. 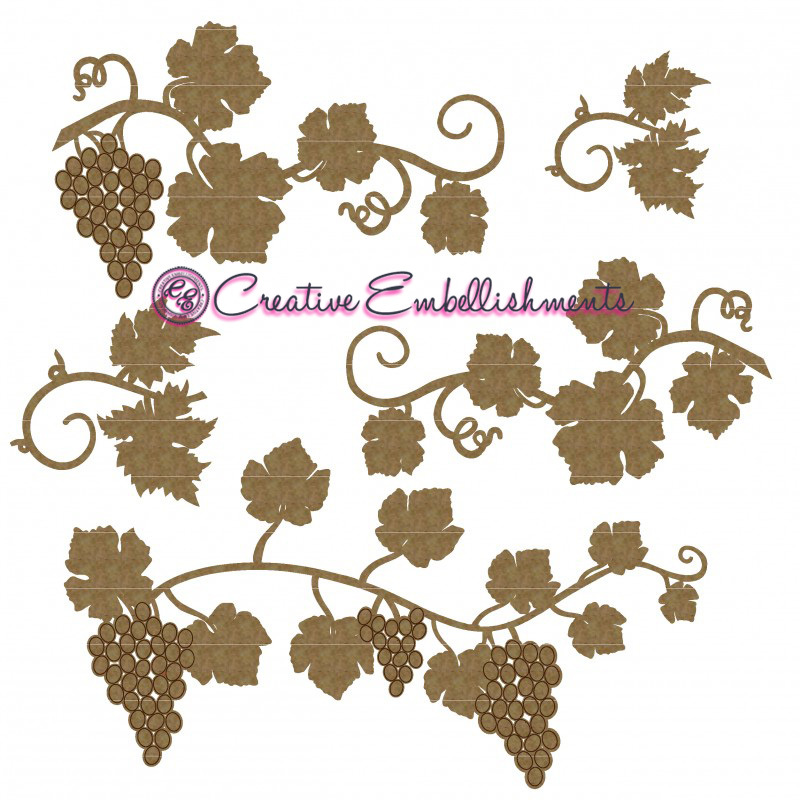 Below is an image of the fabulous detailed Grapevine chipboard. The package has so many pieces in it - such a great value. I was able to make two cards from the same package. 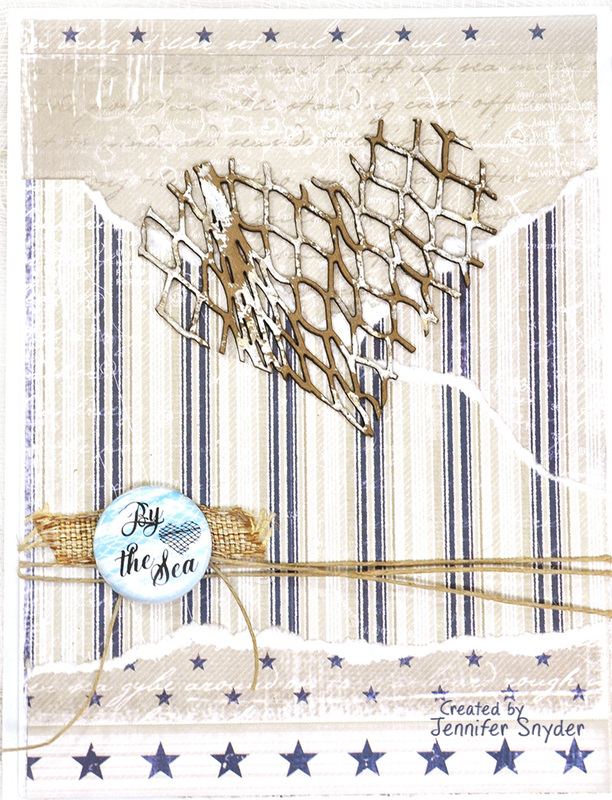 Here is the first card. 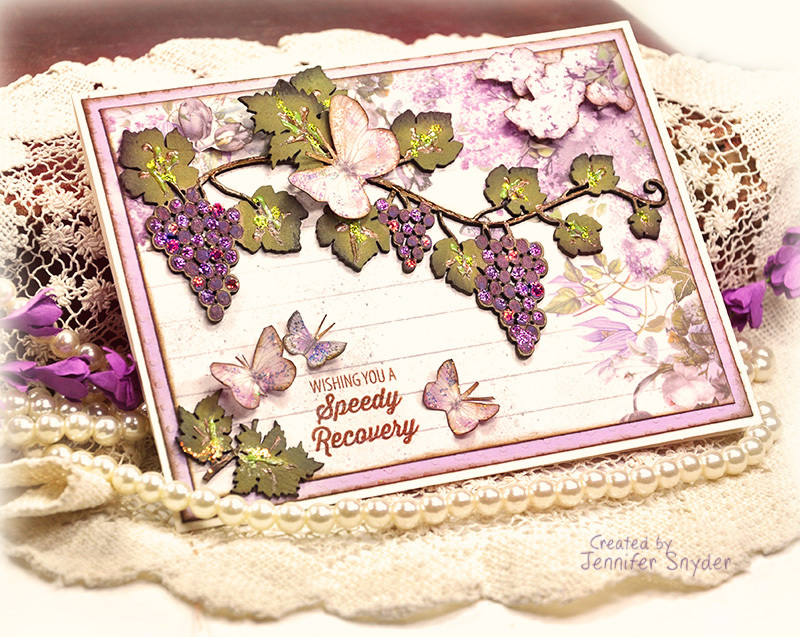 I picked light cheery purple papers for a more contemporary look. 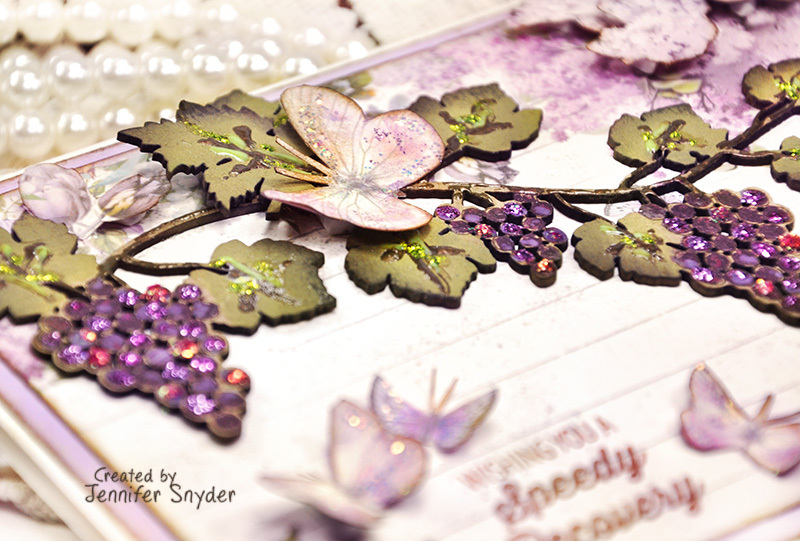 The papers are from Stamperia - Stamperia paper - Lilac Flowers collection. 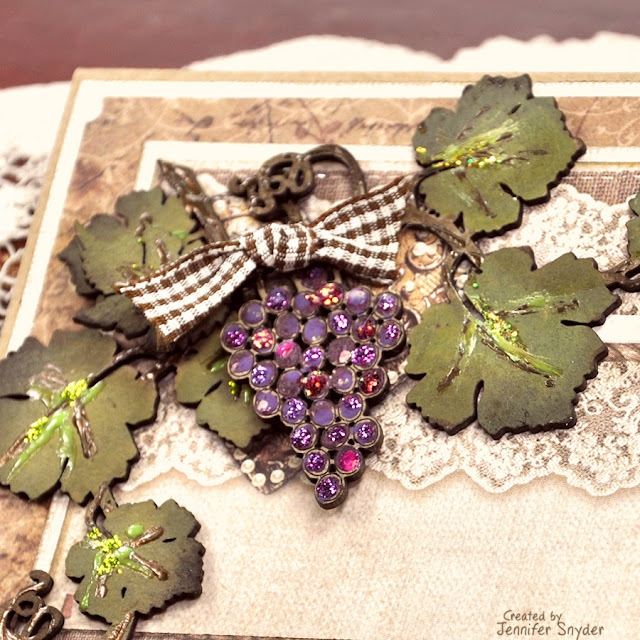 I layered a grape leaf by using a bit of foam on the back to give it dimension. It's true - I cannot paint....At all. All those little lines demanding I stay neat and tidy and not stray outside them. The problem is really two-fold. 1. I don't want to cover the gorgeous detailing of the chipboard pieces. 2. My problem and frustration also happens when the paints bleed on the chipboard. Now I just the "Jen Cheat Method" of chipboard painting detailed chippies. Super easy. 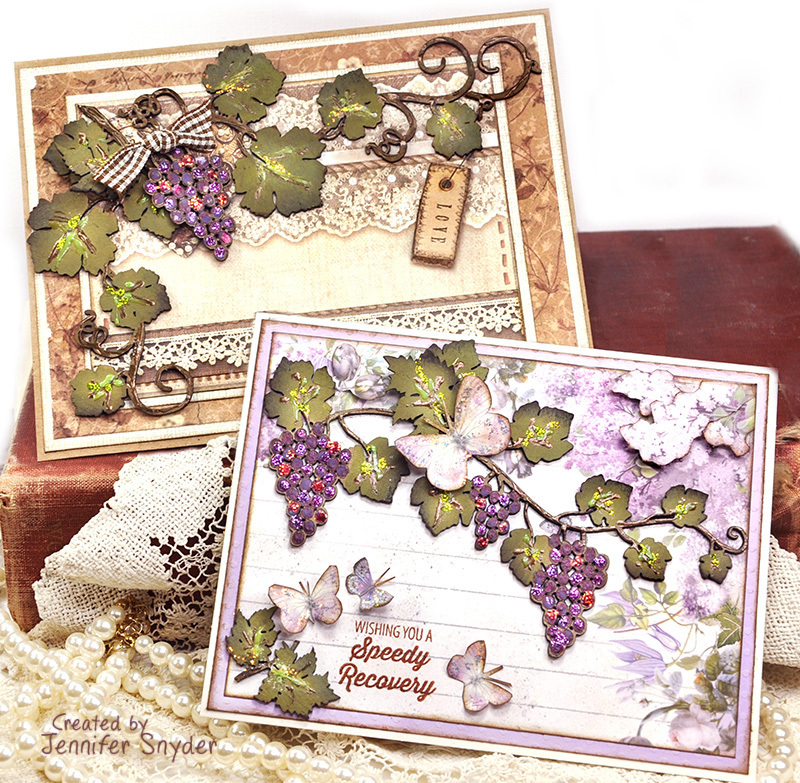 The image below has the steps I followed to created the look of my grapes and vines. Step 1. 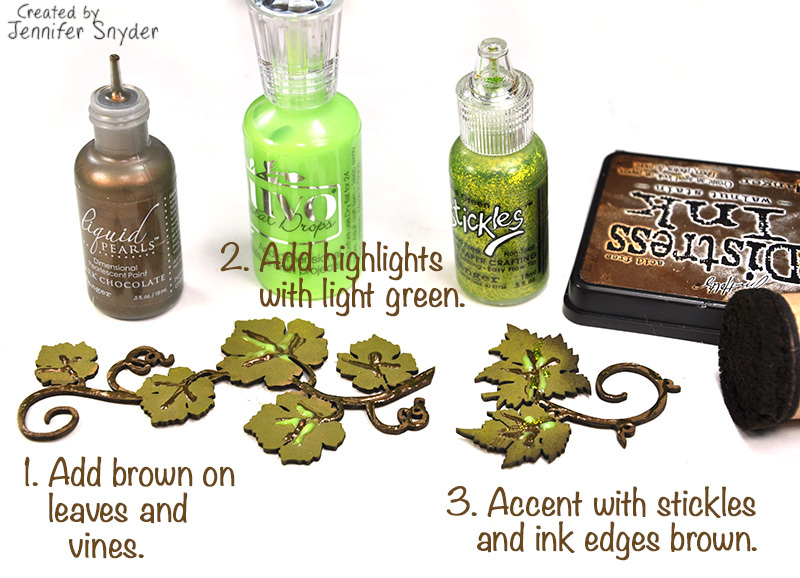 I painted the leaves with Ranger Tim Holtz Distress Paint in Forest Moss. Then I added some brown to the vines and veins on the leaves. I used Dark Chocolate Liquid Pearls . 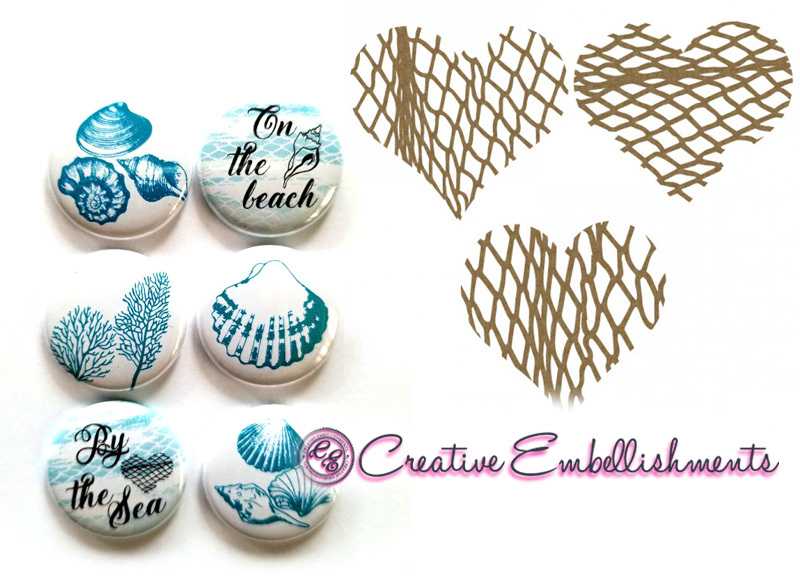 I find that products like Liquid Pearls/Stickles and Nuvo Crystal Drops are easy to use because they have a nice fine tip for detailed work, do not bleed and run and add great dimension to the chipboard. I am not skilled with a paintbrush so anything I can do to make my life easy is the path I'm going to take. Step 2. Next I wanted to add some highlights to the leaves and leaf veins so I added some light green Tonic Nuvo Crystal Drops - Gloss Green Apple. Step 4. Ahhhhh those ity-bity grapes clusters......have I mentioned I'm not skilled with a paint brush? Oh yeah, I sure did. 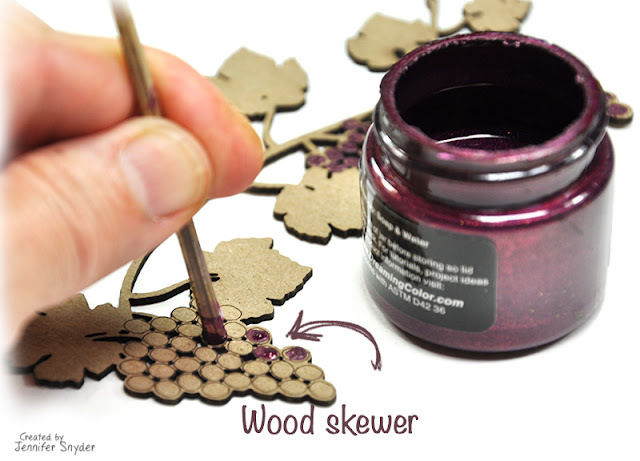 So I used the flat end of a wood skewer to dab a dot of paint on the grapes. Soooooo easy and quick. Step 5. To give the grapes some dimension, I added Stickles to the grapes. 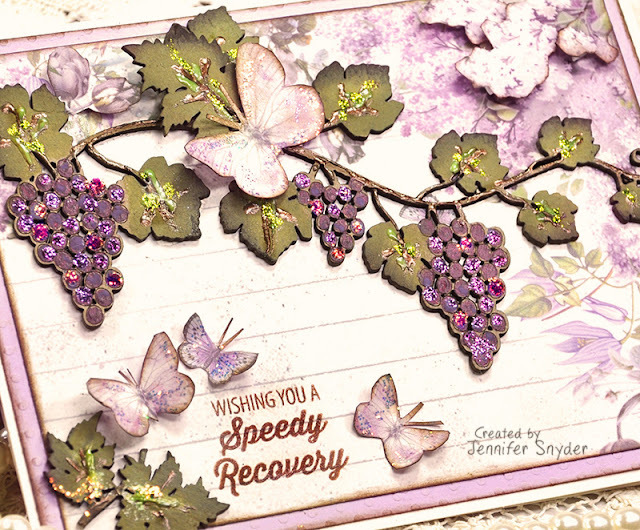 A bunch of grapes on the vine may have different shades of grapes and the different Stickles does just this - adds a few varying shades of grapes. 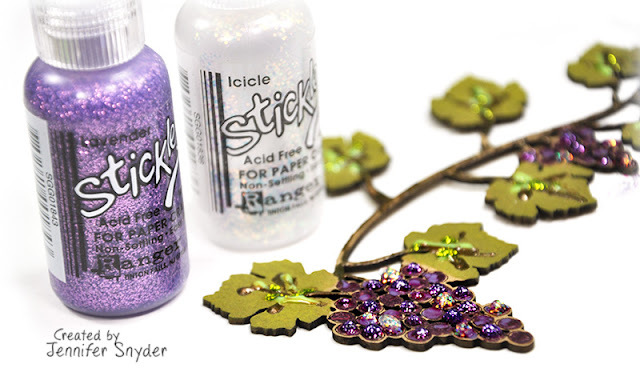 Stickles Glitter Glue - Diamond (Icicle or Crystal). Make sure to let the Stickles dry! 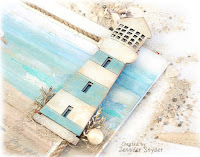 Looking for more DIY chipboard painting "cheats"? 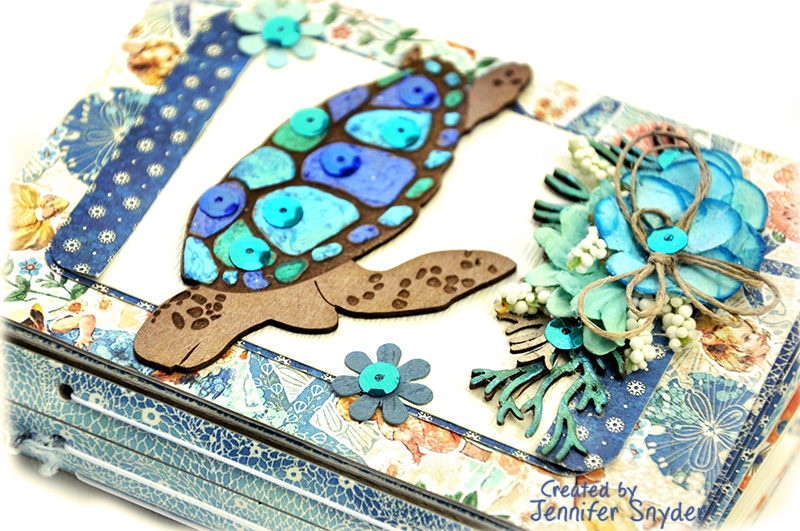 Go here to see how I made the sea turtles. Click here to see the light houses. 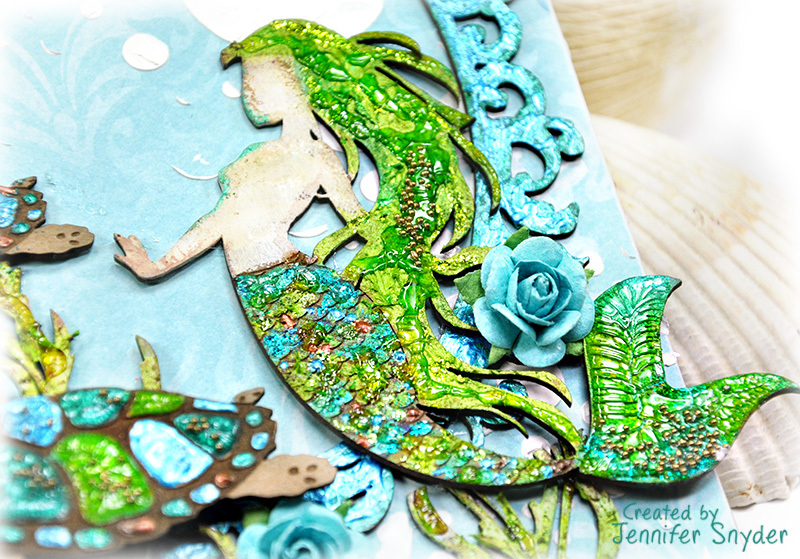 Click here to see the Mermaid. 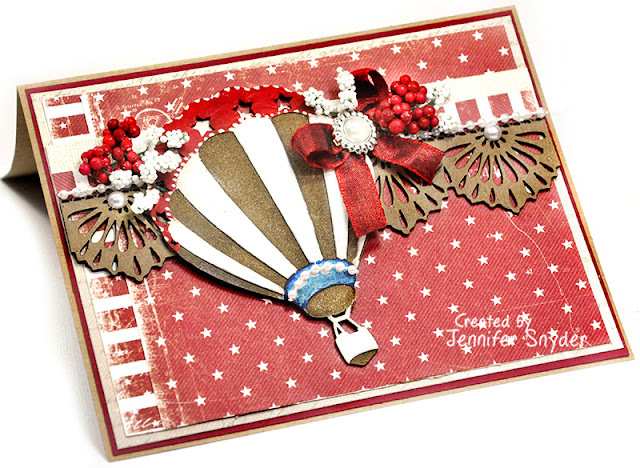 Here is the second card I made with a vintage flair. The grapes and vines have a different feel on the Old Lace paper. I'm here to celebrate Independence Day through the July Challenge at Creative Embellishments. 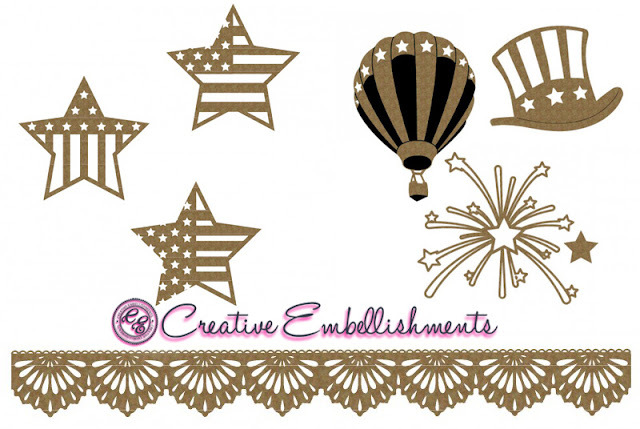 Creative Embellishments has some awesome patriotic chipboard pieces that helped make my cards especially festive. The red card is adorned with a hot air balloon from the 4th of July Set 2 painted with acrylic paint and a beautiful Lace Border (#1) that looks like a bunting. 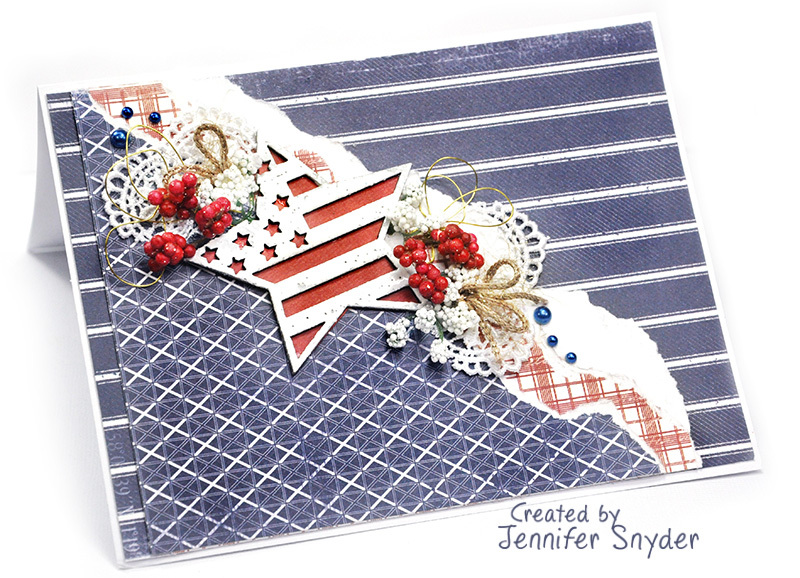 The July Challenge has a patriotic color theme and the twist is color blocking. You can see all the details of the challenge right here. 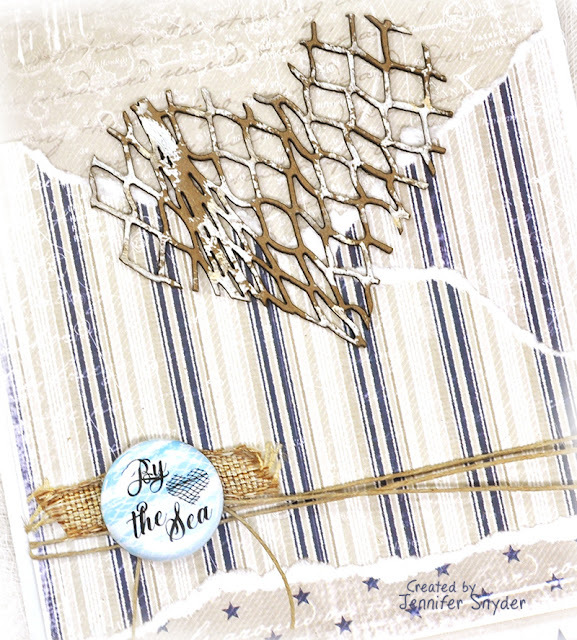 Please join along in the fun and upload your project on the blog post. 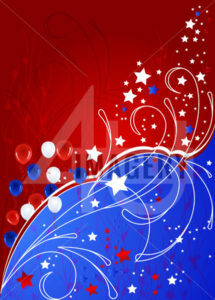 The image below shows the wonderful patriotic chippies I used. The blue card uses the Patriotic Star as the focal point. I embossed the chipboard with white embossing powder and then added a piece of bold red cardstock to make the star pop and really show off the stars and strips of our beloved nation. While really not a color blocked card, I think the different patterns have the effect of some blocking. At least that's the story I'm going with! 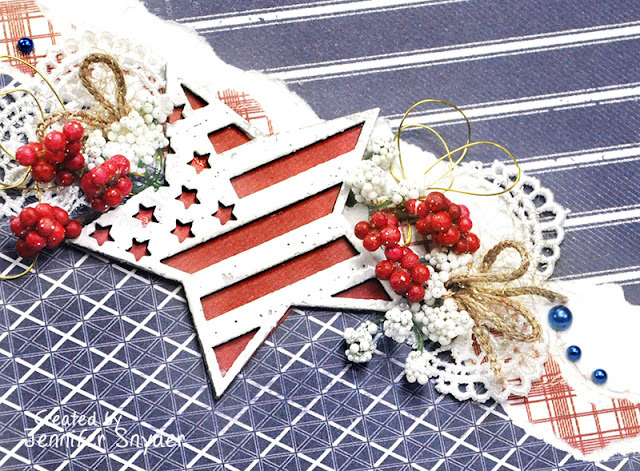 This is the second card - with a bold pop of patriotic red. 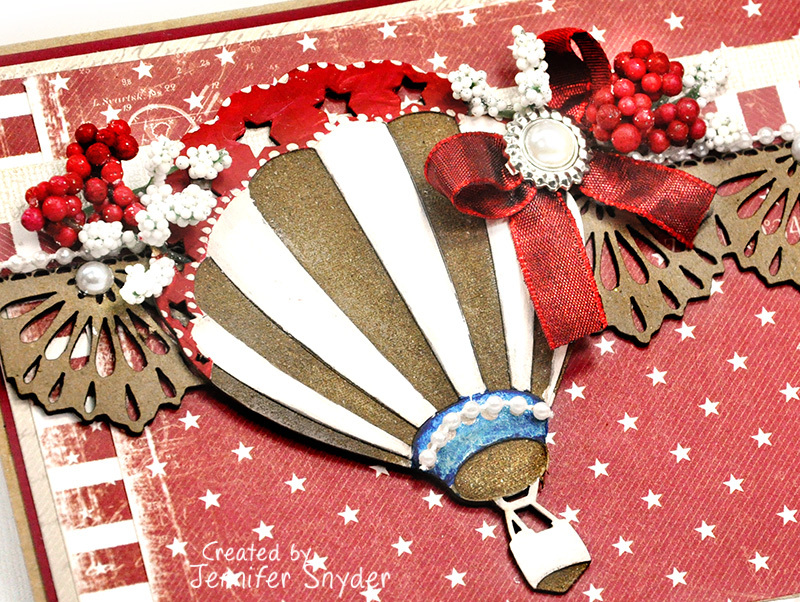 I used acrylic paints for the hot air balloon. Once again, these are the chippies I used on this card. The papers used for these cards comes from Maja Design - Life By the Sea collection.